Bali Surfing They have office in Canggu. Lessons are held on shallow sand beach in Canggu Beach, and prepare 3 - 10 days courses. Instructors are certificated International Surfing Association, so beginners can also learn surfing easily. Canggu Surf School provides lesson in English. They have office in Canggu, and lessons are held on shallow sand beach in Canggu Beach. International Surfing Association certificated instructors give you lesson. 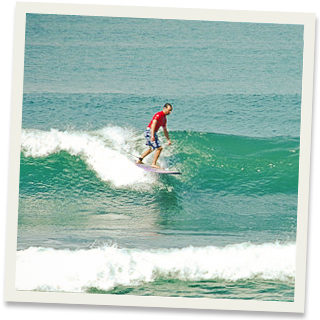 Why don't you skill up in good surfing condition, Canggu? Caggu Surf School offers Semi Private course, 1 instructor for 2 students. There are 3 courses, 3 days course, 5 days course and10 days course. Instructors are ISA (International Surfing Association) certificated, and provide lesson in English. - The schedule above is for 1 day. After 2nd day is almost same lesson, however, it may be changed depend on students' level. It was the first time for me to go to Canggu Beach. I joined a small group lesson, the instructor was nice and friendly. I don`t speak English well, but I made conversation with gesture, I could make conversation with everyone.